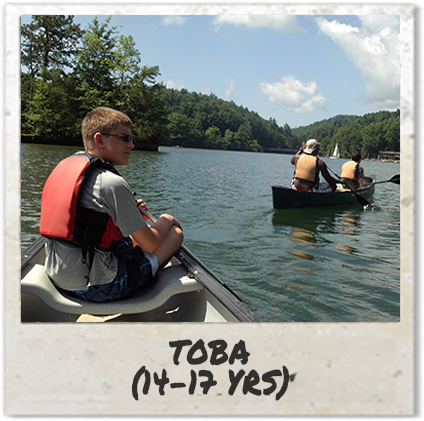 Talisman Open Boat Adventures (TOBA) provides campers with the opportunity to learn the technical aspects of whitewater and flat- water canoeing in a multi-day expedition down the Tuckasegee River into Lake Fontana. Campers will utilize tandem canoes as a tool to strengthen communication skills when navigating the water. On the river, groups depend on each other for basic necessities such as shelter, food, and the collection of water, building a strong sense of community over the course of the trip. Travel trips require flexibility and compromise as the group lives out of canoes and seeks new adventure every day. This can challenge a teen with autism or ADHD, or just about anyone. The staff work with the group to develop ground rules for respecting personal space, voicing opinions and concerns, and sharing responsibilities so that they can move forward successfully and happily. Campers increase a sense of both independence and interdependence as they are responsible for all activities of daily living, from setting up and breaking down camp, to setting a schedule, taking showers, and sharing chores. Talisman’s group-supported problem-solving process is used to practice resolving issues in a goal-oriented and respectful manner. Through this expeditionary experience, staff help campers develop friendships and an appreciation for each other. Campers will spend their first days learning basic hard skills for camping and canoeing. They will work together to prepare logistically for the trip, practice skills each day, and begin to work on problem solving and communication. Once on river they will have opportunities to interact with businesses along the river, meet other canoists and kayakers, develop strong paddling skills, explore nature, and develop friendship with those around them.